Peter Croft (born May 18, 1958) is a Canadian rock climber and mountaineer. He has concentrated much of his rock climbing career on big routes in Yosemite National Park, Squamish, British Columbia as well as the High Sierra. 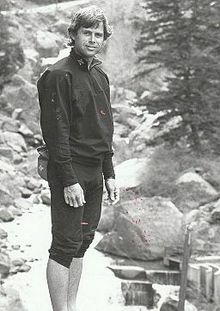 He received The American Alpine Club’s Robert & Miriam Underhill Award in 1991. Croft was born in Nanaimo, British Columbia on May 18, 1958. He grew up in Departure Bay, British Columbia where he was introduced to climbing. Speaking with Peter in the early 2000s at Joshua Tree, he was asked what got him into free climbing. Peter said he was so drawn to climbing that at the end of the day when his other buddies were done and into campfire activities, he needed more. With no partner it evolved into free climbing. Croft has completed a large number of first ascents including a number of free solo ascents. Croft, Peter (July 2002). The Good, the Great, and the Awesome: The Top 40 High Sierra Rock Climbs. Maximus Pr. ISBN 0-9676116-4-4. Croft, Peter; Steve Boga (August 1996). Lightweight Alpine Climbing With Peter Croft (1st ed.). Stackpole Books. ISBN 0-8117-2841-2. Croft, Peter; Wynne Benti (2005-09-01). Climbing Mt. Whitney (3rd ed.). Spotted Dog Press Inc. ISBN 1-893343-14-6. ^ Croft, Peter (July 2002). The Good, the Great, and the Awesome: The Top 40 High Sierra Rock Climbs. Maximus Pr. ISBN 0-9676116-4-4. ^ Kroese, Mark (July 2001). Fifty Favorite Climbs: The Ultimate North American Tick List (1st ed.). Mountaineers Books. ISBN 0-89886-728-2. ^ "Interview with the Legendary Climber Peter Croft". Squamish Climbing Magazine. July 13, 2016. Retrieved November 7, 2018. This page was last edited on 1 March 2019, at 21:16 (UTC).